According to the BEA's first estimate, the economy grew at a miserable 0.2% annualized rate in the first quarter of this year. The current consensus of opinion holds that this will be revised down to -0.9%. However, we've seen this movie before (e.g., last year's first quarter growth was miserable too), and what happens is that growth bounces back in the second quarter. The GDP numbers are notoriously volatile, much more so than the actual economy, which has considerable "momentum." Most of the data I've seen over the past few months suggests that the economy continues to grow at a relatively slow pace. Most importantly, there are none of the classical warning signs of deterioration. Swap spreads continue to be very low and relatively stable. Credit spreads are relatively low, and have come down somewhat from their January highs—most of the damage in the credit sector has occurred in the energy and oil-related space, and even there spreads have tightened in recent months. Monetary policy continues to be accommodative, and the nominal and real yield curves are still positively sloped. Real borrowing costs are very low or negative for most borrowers. Commodity prices are down on the margin, but are still much higher (about 40% higher) than they were a decade ago. Fiscal policy could be much more pro-growth, but it's quite unlikely to take a turn for the worst; in fact, it's not unreasonable to think that tax and regulatory burdens are more likely to ease in the future than increase. One notable exception, however, is the recent trend in cities like Los Angeles and San Francisco to jack up minimum wages. This is like slapping small businesses with a big new tax, as Mark Perry points out, and that is very likely to hurt growth in the affected local economies. The economic ignorance and willingness to pander of politicians apparently knows no bounds. As a reminder, I noted a few months ago that only about 1% of those who work actually earn minimum wage or less. The ones hurt the most from higher minimum wages will be the young and the poor who find that it's much harder to find that first job. The vast majority of workers—and the lion's share of the economy—will not be much affected. Today's economic releases show that the housing market continues to recover at a fairly impressive pace. According to Case-Shiller, U.S. home prices are up over 30% since early 2012, and are only 13% below their all-time highs of 2005. 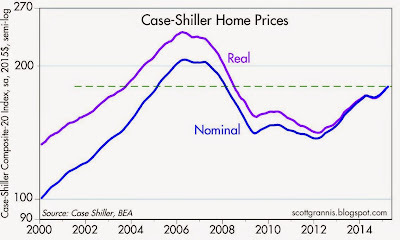 In real terms, prices are still about 25% below their 2006 highs, so we're likely years away from another housing "bubble." 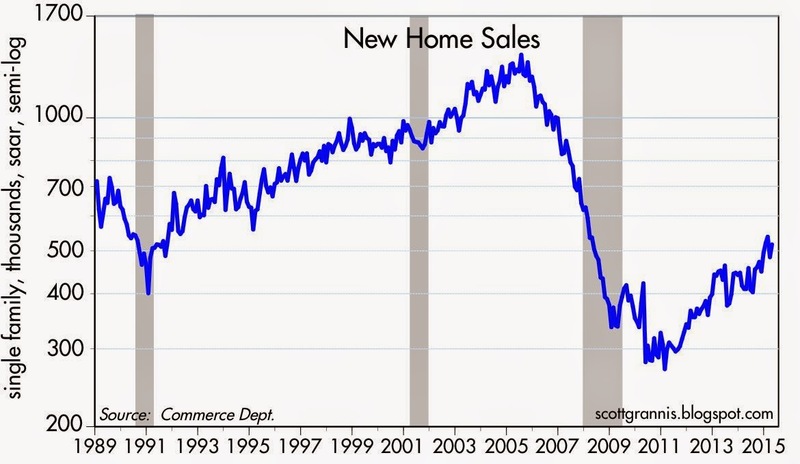 Meanwhile, April New Home Sales were up a very strong 26% from year-ago levels. 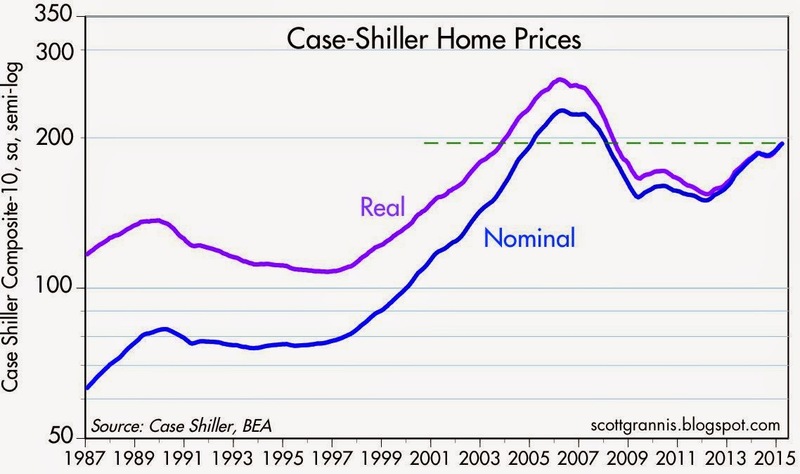 The two charts above show the nominal and real level of housing prices as measured by Case-Shiller. Both show that prices have been moving steadily higher for more than three years. 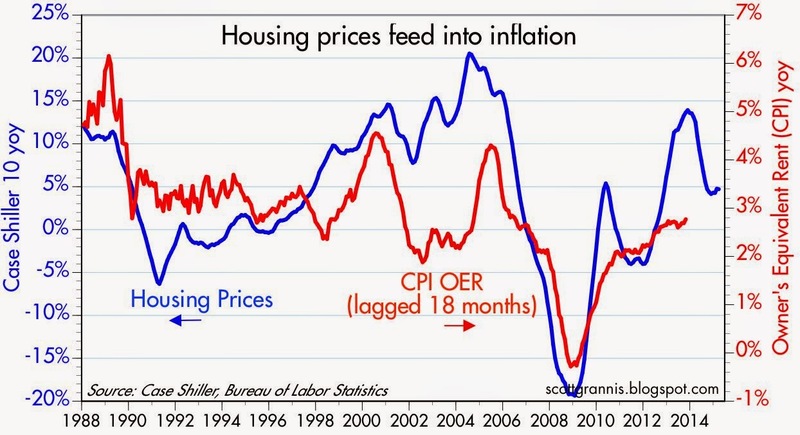 As the chart above suggests, the ongoing rise in home prices (which are up 4.7% in the past year), is likely to contribute positively to the CPI over the next year or so. 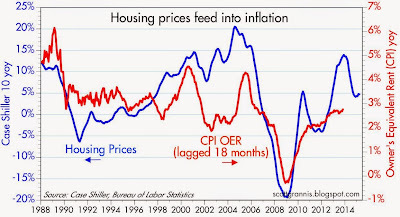 Higher home prices mean higher future rents, and rents make up about 25% of the CPI. 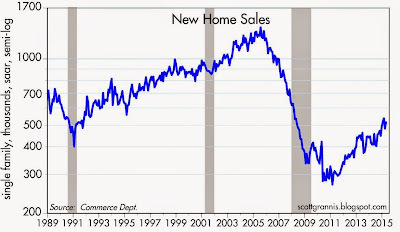 April New Home Sales were stronger than expected (517K vs. 508K), and were 26% above year-ago levels. There is still plenty of upside potential here. 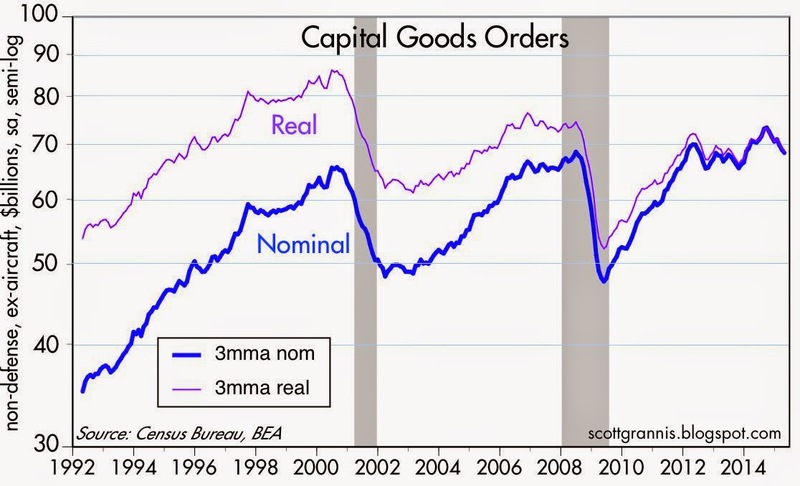 April Capital Goods Orders were also stronger than expected (+1.0% vs. +0.3%), but they remain quite sluggish. I prefer to look at a 3-mo. moving average of capex, and by that measure orders were on the weak side and haven't increased at all since early last year. 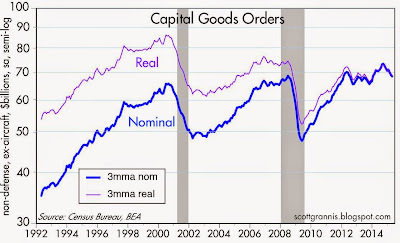 In real terms, capex hasn't increased at all for the past two decades! This is the least impressive part of the economy, since it reflects a dearth of business investment, and that limits the economy's future potential growth. As a consequence, while it's quite likely that GDP growth will be much stronger in the second quarter than it was in the first, that won't change the underlying fundamentals, which continue to point to growth of roughly 2-3%, with a large (about 10%) and growing "output gap" that I estimate to be about $2 trillion. 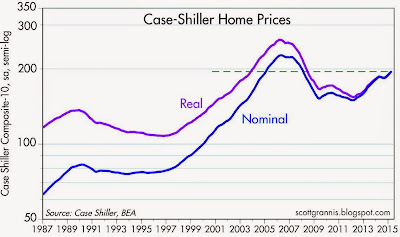 It is fascinating to watch house prices. Many insisted that housing had been in a bubble, although right-winger Eugene Fama instructs us there is no such thing as a bubble. Now prices are recovering. There are good arguments to eliminate the home mortgage interest tax deduction, as it encourages accumulation of debt. Now that is a good and un-PC idea! back to your mention of min wage, while I agree that a very low % of unskilled workers are paid current min wage, I wonder what % are paid $15/hr? I suspect DAMN few and therefore the economies of these cities that pass a $15/hr min wage (including tipped employees btw) will change dramatically over the next few years as business adjusts. expect more technology to replace workers who quite bluntly are just not worth $15/hr. Scott: The Atlanta FEDs GDPNow has been updated to 0.8% GDP growth for the second quarter. I understand this is a quantitative model that becomes more accurate as quarterly releases progress, however JP Morgan estimated Q1 growth at minus 1.1%. Together these data points suggest an economy dangerously close to the FEDs "stall speed", subjectively considered to be two consecutive quarters of sub 2% growth. If OPEC continues to pump oil, which now seems likely, this could be further negative factor for domestic GDP. I guess if one buys JPM's negative Q1, a Q2 of 1.5% could be considered "much stronger" as you say? I don't think there is any sense in the idea of a "stall speed" for the economy. It's a bad analogy, since the economy is nothing like an airplane. Very slow growth does not increase the risk of negative growth, nor does it cause slower or negative growth. Very slow growth can persist indefinitely. I don't see why cheap oil is bad for growth. The more oil OPEC pumps and the cheaper it gets, the better for our economy. I don't try to forecast the actual Q2 growth rate, but I do believe it will be stronger than Q1 growth, and it will likely be stronger than what the market is expecting to see. The BLS has numbers going back to 1979 on the proportion of the labor force working at minimum wage, and that period covers a decent range of minimum wage levels. (I wish it went back another 10 years). Here are some posts I did, using that data along with estimates that MW proponents use of the number of workers who will be affected by hikes in the minimum wage to estimate job loss. The result comes pretty close to estimates of employment loss that I have done based on the change in employment after previous series of national MW hikes. Scott--Of course, as appealing as they are, analogies to the economy are usually inaccurate. That said, when I use the expression "stall speed" in connection to the economy, I mean that any negative influence could push it back into a recession quickly. Then, the Fed would be out of tools as we are already at 0 percent interest rates. as with the Bank of Japan, the Fed would have to go to quantitative easing. But having just left quantitative easing, the Fed will be loath to do that. I would prefer both higher growth rates and higher inflation rates giving the Fed some room to maneuver. Also, I just like higher growth rates! Benjamin: I'm pretty sure Prof. Fama would bristle at being called a right winger. He's a staunch libertarian and, as such, I think he'd (rightly) take offense at being described as a right winger. Scott: I have learned a great deal from your blog and any comment of mine is not adversarial - I am just trying to learn and I value your opinion. And if your opinion is different from the FED - I am not sure which I would choose - but I would act on what I thought the FED believes! and can be moderately useful in forecasting recessions." As an investor I guess it really does not matter if the FED makes congruent analogies. But I would like to try to understand what they believe and how they plan to act on it. If you are correct about stronger Q2 growth, it makes a rate hike in 2015 more likely. I personally do not believe that the "stall speed" analogy is helpful in predicting recessions, and the Fed's language you cite (i.e., it "can be moderately useful") is not very strong support for the concept. In any event, if the economy continues to putter along at anything within a 0-2% range, I think the Fed would see that as a reason to continue to hold off on rate hikes. Unless, of course, something else were to happen that would suggest a tightening is appropriate (e.g., a clear pickup in inflation, a serious weakening of the dollar, and/or very strong loan demand). I've been highlighting the pickup in loan demand for some time now, but I don't think it has crossed the threshold yet where it becomes a strong reason for tightening.